This moulded gourd is the largest and most elaborate gourd in the collection. Its peach shape was obtained by using a mould which would have restricted its growth. The marks made by the five sections of the mould are still visible. 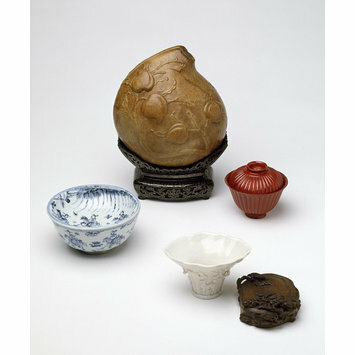 Eight small peaches are moulded on the surface, making a total of nine, an auspicious number associated with long life. The emperor's mark of Qianlong, shanwan, is moulded in low relief on one shoulder. The gourd is mounted on a hardwood stand decorated with silver inlays, almost certainly contemporary. The object was probably created by a wealthy hobbyist; on one side a mark reads: 'Beautiful object made for enjoyment in the Qianlong era (1736-95)'. It was used as a display piece. 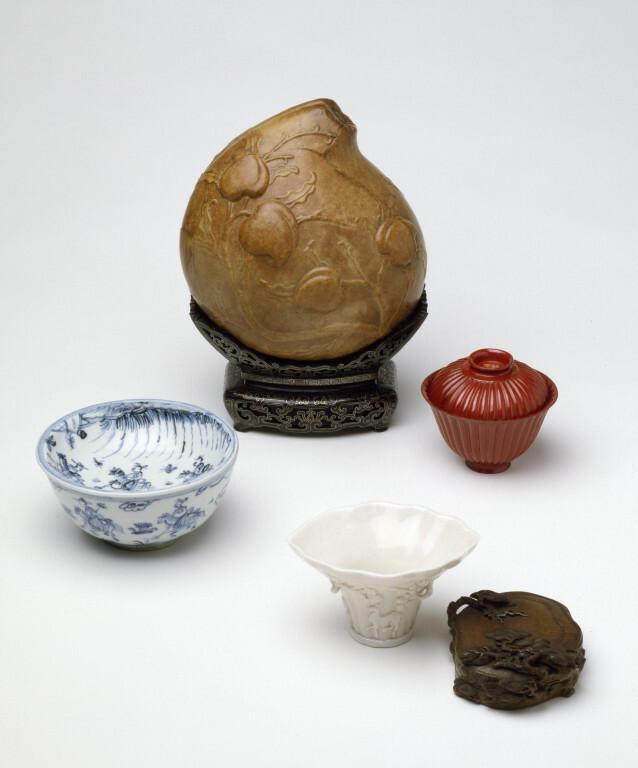 Gourd, peach-shaped, decorated with nine moulded peaches in deep, clear relief. Hardwood stand carved with floral scrolls and inlaid with silver wire. Clunas, Craig. Chinese Carving. London: Sun Tree Publishing Ltd in association with the Victoria & Albert Museum, 1996. p. 67, fig. 81. Kerr, Rose (ed). The T.T. Tsui Gallery of Chinese Art and Design. London: Victoria & Albert Museum, 1991. p. 22, fig. 2. This decorative piece was obtained by growing the gourd in a peach-shaped mould. Eight small peaches on the surface of a large peach make a total of nine, an auspicious number as it is homophone of the word 'eternity'.